Are you like me? This time of year, do you have visions of sugarplums dancing in your head…and daydreams of happily decorating sweet little gingerbread cookies to leave for Santa? I do. Every Year. How many years have I ACTUALLY baked gingerbread cookies? Not many. The recipes I had tried before all left something to be desired. They weren’t very easy to cut out and transport to the cookie sheet. Or the cookies spread too much and you had no idea if that was a reindeer or a train once it was baked. And the taste and texture were O.K., but nothing to write home about. No more gingerbread regrets, friends!! 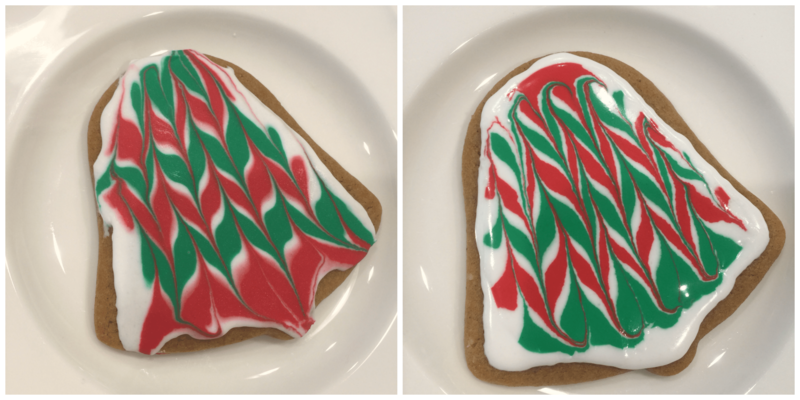 I have found the Best Ever gingerbread cookie recipe from my friend Ashley H.! The simply made dough is easy to work with, the cookie shapes stay intact, and they taste wonderful plain or iced. And I’m sharing this wonderful find with you here today, along with some super-simple-but-beautiful decorating tips that I’ve discovered along the way. ? 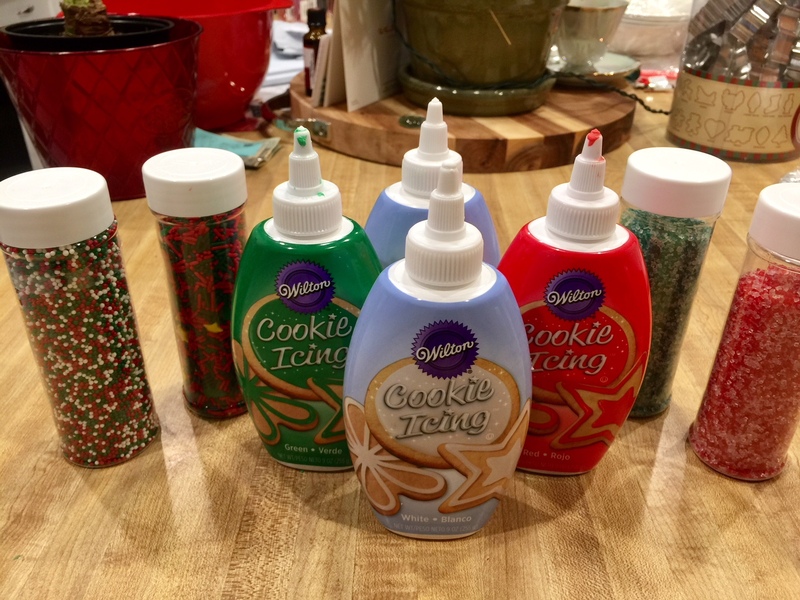 First of all, grab some of these Wilton icing bottles in varying colors. They came in sets of 2 at Walmart. I got a white set and a red/green set. Otherwise, it’s a good consistency when you simply shake it up really well – BUT. Don’t get overzealous and put a bunch of icing on all at once. It’ll look fine at first, but then it’ll slide down over the edges. We hosted our Fusion Family from church for lunch and a cookie decorating party this past weekend. The Fusion Family thing is a new program our congregation is doing and we are really enjoying it – it’s several families of differing ages matched with several college students from FHU. We get together once a month or so and have a meal and/or activity. They loved the cookie decorating thing and so did we! 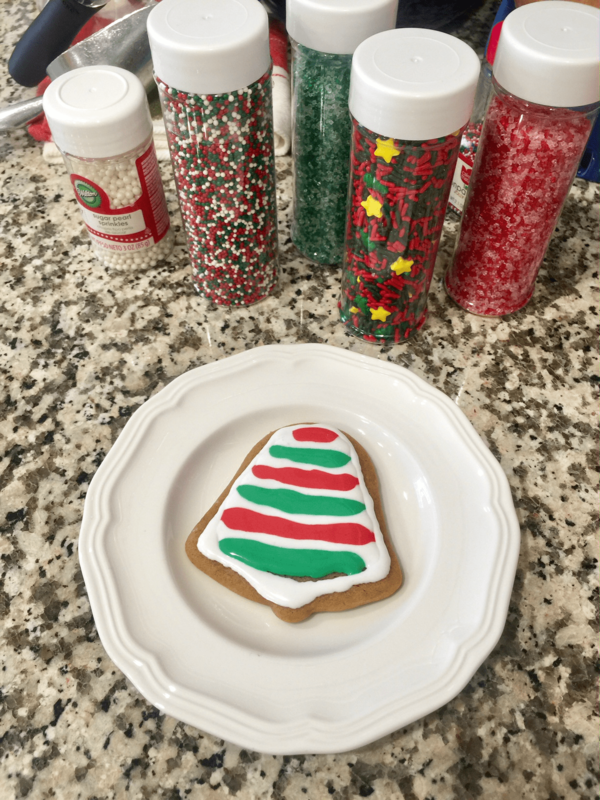 As for the gingerbread cookies, my friend Ashley had found that their family didn’t like them iced – they just like to sprinkle colored sugar on top. So we did that on Saturday. Delicious and cute!! And that is what happens when I don’t set a timer. 😉 They had been in there at least 30 minutes, maybe longer. Oops!! Yikes! I cut out more cookies a couple of days later. The dough worked even better once it had been good and chilled – but I did set it out for quite awhile to warm up some first. We still had bottles of icing left – which don’t need to be refrigerated, so they stay good, consistency-wise. We started playing with them and had the best time! It’s true that the icing does distract a little bit from the gingerbread flavor, but we ended up still liking them really well both ways. =) If you want to keep it simple, you could do a little outline on each one and leave it at that. Still super cute and festive! If you want to try the marbling technique, it’s super easy! Do the thin white outline that I mentioned before, let it sit for about 3 minutes, and then fill in stripes of whatever colors you want to use. I usually start with white stripes and then fill them in alternating stripes of red and green. Like this. Then take a toothpick and gently drag it up and down across the whole cookie. Voila! A delicious and delightfully chewy Christmas cookie...perfect plain, topped with colored sugar, or iced with designs. Gently beat in eggs and molasses. Combine the flour with the rest of the dry ingredients and gradually add to the creamed mixture, mixing well. Scatter some flour onto waxed paper or simply onto your countertop. Knead the dough several times, adding extra flour if the dough is too sticky. Roll the dough to about 1/2 inch thickness. Cut out shapes with cookie cutters and decorate with colored sugars, if desired. Cool completely on wire racks before adding any icing designs. If the dough starts getting too soft, put it in the fridge for awhile to firm up before continuing. Since this recipe makes a lot of cookies, you may even choose to refrigerate some of the dough for another day. This works great - just let the cookie dough sit out at room temperature for awhile to soften up first. There’s nothing wrong with using store bought cookie icing. Did you use your family recipe for gingerbread? I was looking for the gingerbread recipe too. ?. Since I want it all, can you come to AL and do them for me. ? Oh, sure, I’ll be right there! 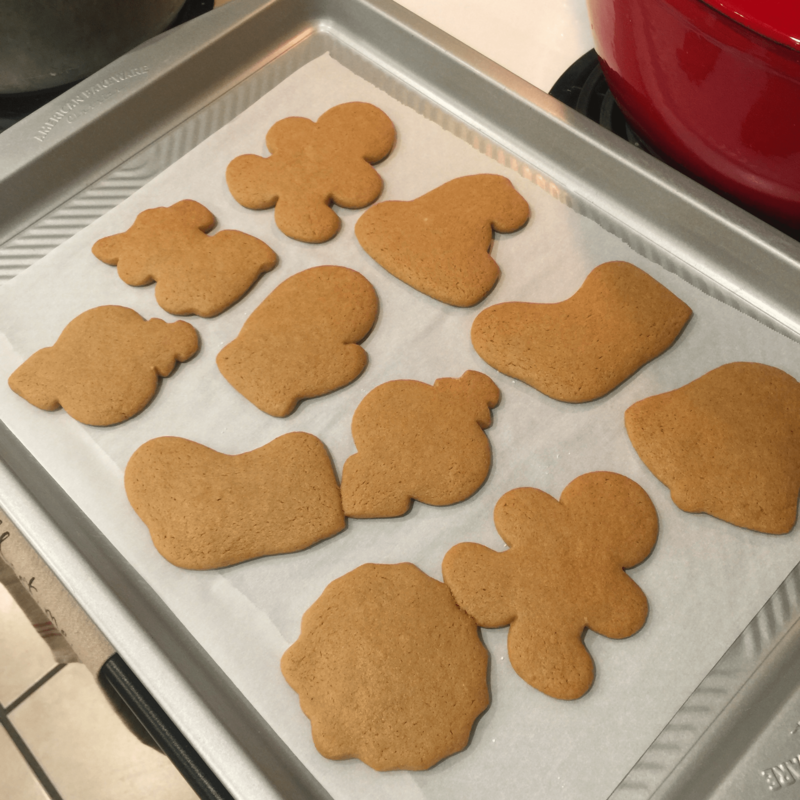 😉 No, I didn’t have a family recipe for gingerbread before – but now I do! We all love it!! I’ve heard it both ways!! Haha!!! Have you gotten to see the Psych movie yet?? What a fun post, Kristen! You have a great, personable writing style. And those cookies look wonderful!! Thanks for the recipe. Gingerbread cookies are my FAVORITE! I think you’ll love these!! Enjoy!